Portugal became very powerful in the 15th century and the Portuguese traded and settled all over the world for the next few hundred years. The Portuguese today don't need to travel so much, they have it all at home. Miles of coast and golden beaches, beautiful mountains, rivers, warm weather, green golf courses and fantastic food. There is plenty of historic buildings and museums in Lisbon and Porto is even a UNESCO site. You don't have to be bored - here you can surf, play golf, watch the sunset, dine alfresco close to or at historic sites or at the beach, and step back in time in sleepy fishing villages. We at VEGA can assist you and your clients with great program ideas. Further down the page: Read about our company * Travel facts Portugal. 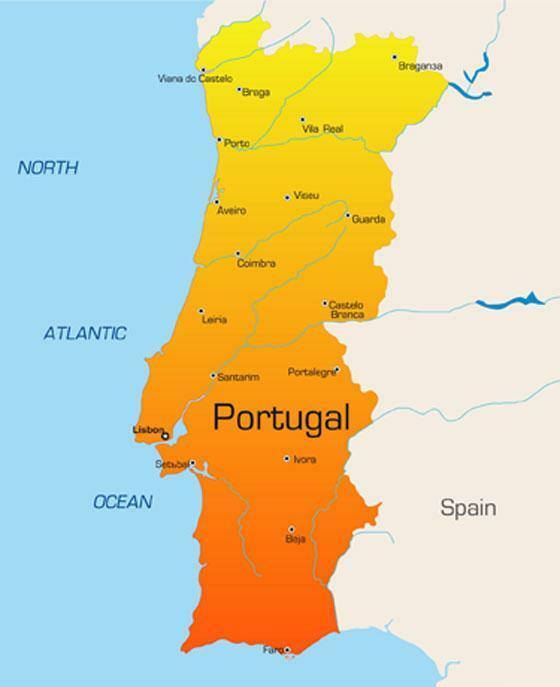 There is also a map of our country and our latest Portugal travel news. With a great knowledge of Portugal and years of experience (since 1988) we are one of Portugal's most professional DMCs. We work internationally and have a wonderful team in place. We also have a Quality Certification ISO 9001 since 2008. We would love to assist you with your next travel to Portugal. With miles of long golden beaches, exquisite restaurants and vibrant nightlife, the region has, for years attracted more tourism than all the other regions of Portugal added together. Floating in the middle of the Atlantic Ocean are the Azores. These nine, emerald green volcanic islands are a group of the most tranquil islands around. The islands are often referred to as garden-like pieces of heaven; you won't find any concrete jungles here, just sweeping beaches, exotic flower patches and beautiful sunsets. The surrounding waters are home to hundreds of dolphins and whales, an excellent spot for a bit of marine life watching. Coimbra is perhaps the countries finest example of the past. Six of Portugal's Kings were born here and in 1139 until 1256 it was the chosen capital of the country.With one of Europe's oldest universities, fine Roman ruins, ancient convents and numerous museums, Coimbra is second only to Lison and Oporto. Evora stands out quite distinctly on the vast horizon of the Alentejo plain, on the top of a gentle hill, dominated by its imposing cathedral. Its historical centre, protected by a vast ring of fortified walls, is typical of ''golden age'' cities, with its urban landscape exhibiting features from the architecture of countries in other continents where Portugal established a presence, particularly Brazil. Lisbon is a legendary city with over 20 centuries of History. The Alfama is one of the oldest quarters in Lisboa. Since it largely survived the earthquake of 1755, the area still retains much of its original layout. Adjacent to the Alfama are the likewise old quarters of Castelo and Mouraria, on the western and northern slopes of the hill that is crowned by St. George's Castle. Every year in June, the streets of all three quarters come alive with the feasts in honour of the popular saints. The island of Madeira is lapped by the waters of the Gulf Stream with warm comfortable summers and mild winters that make it an enchanting destination all year round. Perched on a hill rising out of an agricultural plain, Óbidos is one of Portugal's picturesque gems. From its lofty centre one gazes upon expanses of vineyards speckled with whirling windmills and terracotta-roofed homesteads. Nearer, narrow cobbled streets, lined typically with whitewashed, bougainvillaea-draped houses, wind up to the walled interior; the name Óbidos stems from the Latin for citadel. First remarked upon for its beauty by the 13th century Queen Isabel de Aragon, Óbidos was presented to her as a gift by her husband King Dinis and thenceforth it has been offered by princes to their brides. Capital of port wine and a fascinating mix of Baroque and modern art and architecture. Porto's most striking characteristic is that of ‘faded grandeur'. Stroll through the narrow streets of the UNESCO-listed historical sector, enjoying the labyrinthine, flower-bedecked streets, and the many superb examples of Portuguese azulejos (tiles) gracing myriad churches and secular buildings.